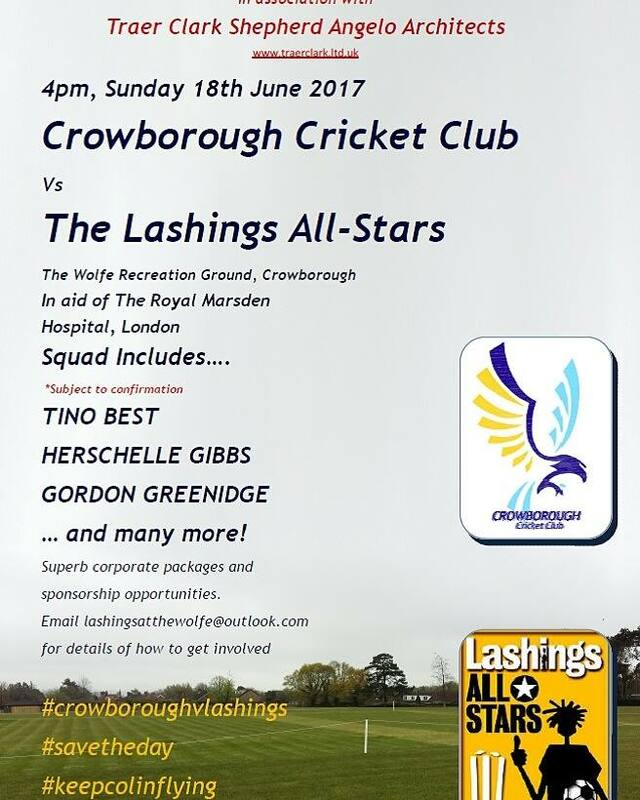 Crowborough Cricket Club will be entertaining the world renowned Lashings All-Stars at the Wolfe Recreation Ground next June. Lashings World XI grew from an unremarkable pub team in Maidstone when they started to attracted a number of international cricketers and other celebrities to their ranks. They travel across the country to promote the game of cricket. Currently the Lashings squad includes Tino Best, Herschelle Gibbs, Andrew Hall, Tim Paine, Yasir Arafat and Michael Carberry. This is potentially one of the biggest sporting days in the towns history. The day will comprise an open coaching session from some of the world’s finest players (£10 per player, max 100 players) and then a VIP lunch hosted by Lashings where if you chose the right corporate package they will even join your table. The Lashings’ players will be available for autographs all day. The match itself which should start about 4pm in a T20 format. There will be a £5 charge for entry (over 14s) on the day (entry by programme only). 10% of profits will go to support The Royal Marsden Hospital in London. The Club have set up a special email address for all enquiries about tickets and sponsorship opportunities: lashingsatthewolfe@outlook.com.